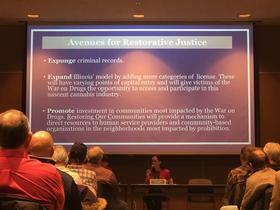 When talking about legalizing recreational cannabis in Illinois, the conversation has shifted from “if” to “when.” Still, many residents have questions and concerns about what such a program would mean for the state. Lawmakers pushing for a legalized program held a meeting in Springfield on Monday where they attempted to clear up any confusion and gather feedback from residents. Despite the frigid temperatures, the Carnegie Room of the Lincoln Library was standing room only for the town hall meeting. It was a diverse group of advocates, members of the medical cannabis community, the new Director of Agriculture, and just regular people. 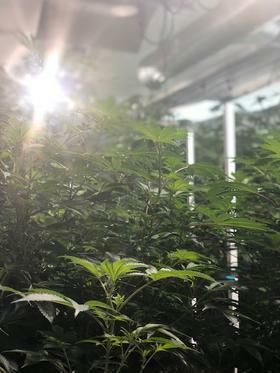 State Sen. Heather Steans and Rep. Kelly Cassidy, both Chicago Democrats, are leading the charge for a recreational cannabis program. Before they took questions, they laid out what they are proposing. "This will allow Illinois residents ages 21 and over to purchase and possess up to 30 grams of cannabis," said Cassidy. "Non-residents get half that. That's pretty standard across the country." Cassidy said the provision for out-of-staters to have less would prevent "leakage" - someone from Iowa for example, where recreational marijuana isn't legal, buying a lot in Illinois and bringing it home with them. The proposal would also allow municipalities to opt out of the program, which means they could prohibit dispensaries from setting up shop within city limits. They can't restrict residents from privately using the product, though. Localities would also be allowed to add an additional tax. However, the bill would cap how high that tax can be so it does not drive residents back to an illicit market. "When we went out to Colorado, we met with the Boulder County District Attorney and he told us a cautionary tale that we've carried with us ever since," said Cassidy. "His county, relatively affluent, not a lot of fiscal pressure there, they didn't add a local tax. And they saw their illicit market all but disappear. In neighboring Pueblo County, a community with some significant fiscal challenges, they put the maximum tax on that they could and their illicit market grew." The bill allows employers to maintain a drug-free workplace, landlords can restrict access to cannabis, and adults can grow up to five plants per household. In terms of the tax dollars, Cassidy and Steans are still negotiating the "optimal tax strategy." Recognizing that conversations about recreational cannabis almost always include talk of added revenue for the cash-strapped state, Cassidy said they are not creating the program to make money. "Step one is ending prohibition, undoing the harm of the war on drugs, and then there will be revenue," she said. "Estimates are $350 to $700 million. Put a pin somewhere in the middle, let's say $500 million. That's nothing to sneeze at, but it's not the 'why.' It's not the reason." Packaging and labeling is also a key point within the bill. Cassidy referenced the 2018 deaths in central Illinois linked to synthetic marijuana that had been laced with chemicals found in rat poison. She said those individuals did not know the product they were getting. A state-run program will ensure a quality product. "This is not your grandfather's ziploc baggie," she said. "What you're getting is a product that talks explicitly about how it was grown, what it was treated with. You know what you're getting." Steans added that the real goal is to entice people to buy cannabis legally: "It's a better, safer product. You can't [give] access to teens and we want to make that illicit market go away." One of the most-asked questions was about road safety and how law enforcement will be able to handle people driving under the influence. The anonyous, audience-submitted questions were bunched together because they dealt with similar topics. "Since Colorado legalized recreational marijuana, it has seen an increase in marijuana-related traffic deaths, addiction and emergency room visits. So then why should we legalize it?" the first question read. "The reality is that there aren't definitive studies on this," said Cassidy. "We've got studies that show that deaths go down. We've got studies that show traffic incidents go down. Colorado has actually seen a steady decrease now as they've done a better job with public education." Both Cassidy and Steans have emphasized that they would like part of the revenue to go towards education campaigns. Although this program will be adult-use only, educating children and teens about the harm marijuana can have on a developing brain is a priority for many stakeholders. This was also an important topic at Monday's meeting. Another question read: "What penalties will be included in the bill, if any, that would target those who supply cannabis to minors?" Steans said that will remain illegal, and they are actually taking steps to harshen penalties for minors who are caught in possession of cannabis. "If a teen is caught drinking, their license can be taken away from them until they're 21," said Steans. "Right now, that's not in place for cannabis. If a teen is caught smoking cannabis, they don't lose their license. We're going to change that in the bill. If they are found smoking, their license will be taken away until they're 21." Audience members also inquired about the number of dispensaries throughout the state. Currently there are 60 for medicinal cannabis. Steans said they plan to make the products accessible, but there would be zoning restrictions so dispensaries are not too close to each other. The legislation will also include a system to help diversify the industry and prioritize local ownership. The sponsors say they would like this to be a small business opportunity for communities. "Because we are going to be continuing to limit the number of licenses, you can get preferential treatment towards equity applicants," said Steans. "Giving additional points for diversity, diversity of ownership, diversity of the workforce, diversity of how you're spending your dollars on contractors and if you are a majority, if you're actually incubating and helping to grow an equity applicant." A portion of the bill that has generated a lot of attention is how this will impact people who have been arrested for marijuana possession in the past. Although this legislation is not needed for prosecutors to expunge records, including it in the law could ensure that it happens. "We want to make sure it happens in a meaningful and as close to automatic way as possible," said Cassidy. "The expungement process currently is pretty burdensome and expensive and confusing and daunting. We do want to make sure we make it easier... the ability to move on from your past is something we should be facilitating." Lawmakers hope to file a measure soon and have high hopes it’ll pass with bipartisan support. Still, there’s plenty of key details to be worked out. Such as how to effectively tax the product and where the tax revenue will go.